Famed chef Marion Grasby at Khlong Toei market in Bangkok, Thailand. 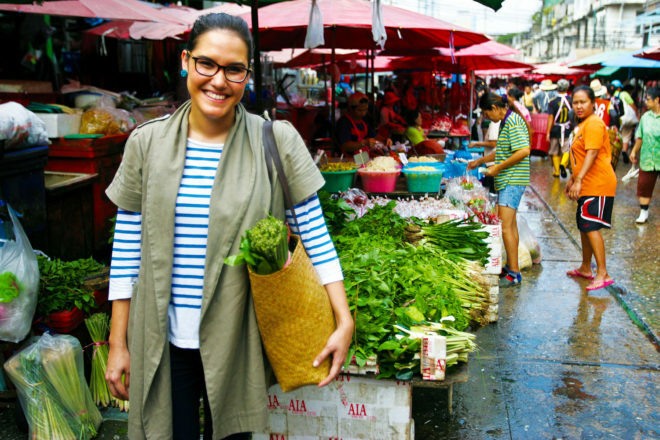 Perhaps best known for her stint on MasterChef, Thai Australian cook Marion Grasby grew up in Darwin but travelled a lot through Thailand, Papua New Guinea and Australia with her globetrotting parents, spurring her love for travel and food. With studies in law, journalism and gastronomy behind her, Marion now resides in Bangkok where she creates her Marion’s Kitchen Asian food range. What do you love about living in Bangkok? One minute I’m sitting on a plastic stool by the side of the road slurping up a steaming bowl of noodle soup and the next minute I could be sipping a martini while lounging on the deck of a Bangkok sky bar. I love this city – the contrasts, the contradictions and above all else… the food. Why did you decide to settle there? I’ve been creating my Marion’s Kitchen Asian food range out of Thailand for the past three years and as the company has grown it made more sense to be based in Bangkok where I can work more closely with my producers and suppliers. And also I couldn’t resist the lure of moving to a city where green papaya salad and fried chicken vendors are on just about every street corner! How important is food to the Thai way of life? Most Thai people have a relationship with food that borders on the obsessive. Arguments abound about the best som tum (green papaya salad) or the most skilled moo ping (grilled pork satay) vendor. Lunchtimes in Bangkok are sacrosanct and it seems the whole city must come to a stand still as office workers pour out of high-rise towers to sit together and share a meal. Is there one quintessential ingredient in Thai cooking? Fish sauce and chilli would be two of the most well used ingredients in any Thai kitchen. But what I find most exciting about Thai food is the intricate play of sweet, sour, spicy and salty flavours that characterises this cuisine. I adore the fact that big, bold flavours like chilli, fish sauce, garlic, tamarind and palm sugar can blend together to make an amazing, well-balanced sauce. Is it safe to eat anything and anywhere in Bangkok? I eat street food in Bangkok just about every day and I’ve never been sick. But in saying that, you do have to have your wits about you. I always choose street cart vendors that seem very busy because the turnover on their produce is likely to be high (and also the more Thai people in the line, the more likely it’s going to be good). I also avoid uncooked fruit that’s been cut because without the heat of cooking there’s more chance of there being an issue. But apart from that I’m pretty adventurous when it comes to street food and I firmly believe the best Thai food is more likely to come from a street-side cart than a fancy restaurant. Where’s the best place to eat breakfast? I am addicted to a Thai breakfast rice soup called khao tom, especially when it’s flavoured with minced pork, a raw egg cracked into the hot rice, ginger, coriander, fish sauce and loads of chilli. My local khao tom street cart is on Sukhumvit Road near Soi 31 but you’ll need to get up early because they usually pack up by about 9am. What’s the signature Thai dish everyone should try? You can never eat too many curries in Thailand – green, red, yellow, panang, massaman. The yellow fish curry at a no-frills southern Thai restaurant called Khua Kling + Pak Sod is unashamedly traditional and definitely one for chilli lovers. For more of a fine dining experience, the slow-cooked lamb shank massaman curry at Issaya Siamese Club is absolutely divine – in fact it’s worth coming to Thailand just to try that one dish! What are your favourite Thai snacks? Bangkok is famous for its fried chicken and deservedly so. Each crispy piece has been marinated and fried to crunchy perfection. The fried chicken street vendors are generally out and about during the day around lunchtime. I have a favourite vendor on Ratchadapisek Road (almost at the corner of Sukhumvit Road) outside the Exchange Tower building. What’s the ultimate five-star dining experience in Bangkok? It’s not often that ‘fancy’ Thai restaurants live up to their hype because the street food vendors and no-frills canteen-style restaurants always seem to do it better. But David Thompson’s nahm is the exception. It produces Thai food that is authentic and absolutely delicious. The wagyu beef curry and grilled pork neck are my favourite dishes there. Book well in advance, though, because it’s gained a spot in San Pellegrino’s The World’s 50 Best Restaurants so it’s popular. Where should visitors head to get a real feel for the street food scene after dark? I often take visiting friends to my favourite after dark street food haunt on Sukhumvit Soi 38, near the Thonglor BTS station. A cluster of street food vendors and canteen-style restaurants open up here from about 5pm each evening. We generally pull up a plastic stool and order some cold beers while the designated food gatherer (usually me) walks up and down the strip pointing and ordering plate after plate of food. Look out for the braised pork vendor who will be standing in front of a huge pot of simmering dark broth and chopping up pieces of slow-braised pork. This dish is called khao kha moo in Thai but I find the best way to order if you can’t speak the language is to simply point your finger and smile. This is also the place to order street-cart pad Thai and seafood omelettes. Be sure to try out the steamed and fried chicken here. And leave room for dessert – try the mango and sticky rice or a sweet roti. Where’s the best place for cocktails? Give the big, brash touristy bars a miss and discover just how quirky Bangkok can get. The Iron Fairies in Thonglor is a moody labyrinth of stairwells and booths. It has great live jazz and arguably the best burgers in the city. Or head underground and pull up a stool at Maggie Choo’s tiny noodle shop underneath the Novotel on Silom Road. Order a martini and slurp up a bowl of wonton noodles before walking through a heavy curtain and into a cavernous prohibition-style nightclub. But if you want a cocktail with a view, head to a sky bar called Above Eleven at the Fraser Suites. It draws more of a local crowd than the famous and far more well-known sky bars in the city. Book a table in advance to get the best view. Has wine culture caught on in Thailand – is there a wine bar you would recommend? My Thai friends don’t have a natural love of wine and getting a good glass of wine at a good price can be a little difficult. But there are a select few places I would recommend including Le Beaulieu at Athénée Tower and the Smith on Sukhumvit Soi 49. Where are your favourite places to shop for ingredients? I adore the chaos, sights and smells of local fresh markets in Bangkok. My go-to market is a massive labyrinth of stalls at Khlong Toei Market on the corner of Rama IV and Rama III roads. This is where I’ll buy fragrant bunches of Thai basil, bundles of fresh lemongrass and bagfuls of fiery chillies. What is the one tool every Thai kitchen should have and where can you buy it? A good solid mortar and pestle is essential for any Thai kitchen. The heavier the better because the weight of the pestle will make light work of pounding out pastes or grinding spices. You can buy them at a weekend market called Chatuchak. There are loads of stalls here selling everything from kitchen essentials to artwork to jeans and handbags. And the street food here is awesome. I like to rent one of the picnic rugs in the park adjacent to the market and settle in under the shade with some green papaya salad and grilled chicken. Where do you go when indulging in non-foodie retail therapy? Bangkok is heaven for shoppers. Siam Paragon is where I go to window-shop the luxury brands – Chanel, Gucci, Dolce & Gabbana. My favourite dumpling place, Paradise Dynasty, also happens to be there on the fourth floor of the complex. It’s the best place to indulge in exquisite xiao long bao (Chinese soup dumplings). For a more local (and cheaper) shopping experience head to Terminal 21 at Asoke. I love browsing through the stalls on the upper levels where quite a few local jewellery designers display their pieces. What is the ultimate Thai souvenir people should take home with them? Recipes! Recipes always mean far more to me than any trinket from a souvenir shop. Take a cooking class or just have a chat to the lady making your noodle soup. What unique Bangkok experience would you recommend to visitors? Seeing Bangkok from the river gives you such a different perspective. Bangkok was once dominated by canals, which formed the main ‘roads’ of travel all across the city. Most of the khlongs have been covered by concrete and turned into busy streets but some of them still remain. You can take an organised tour or just hire your own long-tail boat at one of the piers along the Chao Phraya River. Try the Tha Chang Pier near the Grand Palace. Where else in Thailand should people visit for excellent regional cuisine? The food in the north of Thailand is very different from central Bangkok food. I find it a little milder and heartier because of the cooler climate. Khao soi is a northern noodle soup speciality made with a spicy coconut broth. I have to admit to travelling to Chiang Mai just to get my fix of khao soi! And the northern slow-cooked pork curry is another must-order when you’re eating in Chiang Mai. Would you recommend any cooking schools? I’ve heard great reports from friends about the Blue Elephant Cooking School. I would also recommend a class called Cooking with Poo [run by local Khun Saiyuud Diwong, nicknamed Poo! ], which includes a tour of Khlong Toei market. What’s your favourite cultural site? I find the Grand Palace compound a beautiful place to explore. The grandeur and scale of the palace buildings is astounding. It’s best to go early in the day when it’s not so hot. Zurich's best waterside bars and more!